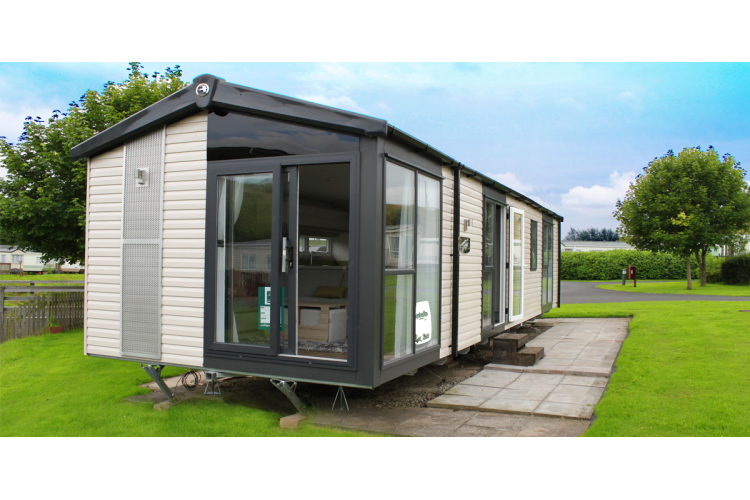 The Alsace Lodge is an exciting new range that captures modern day design influences and offers a striking exterior with Mist Grey CanExel cladding and anthracite glazing. 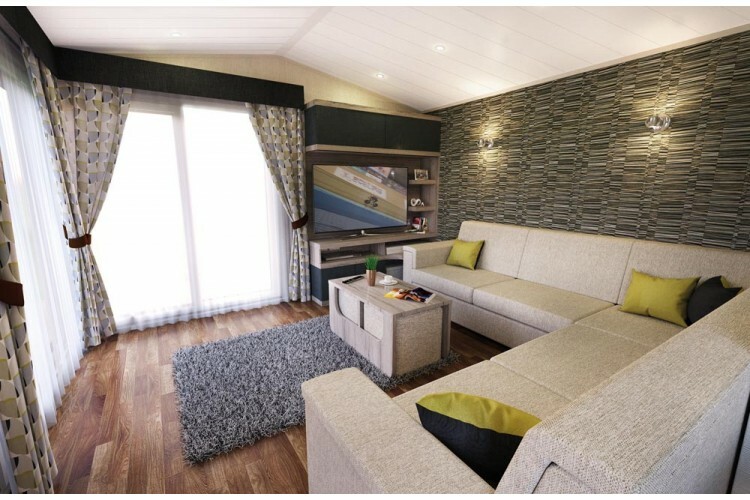 The inside will really appeal to those wanting fresh design with a high specification. The master bedroom is enhanced with a walk-in shower. 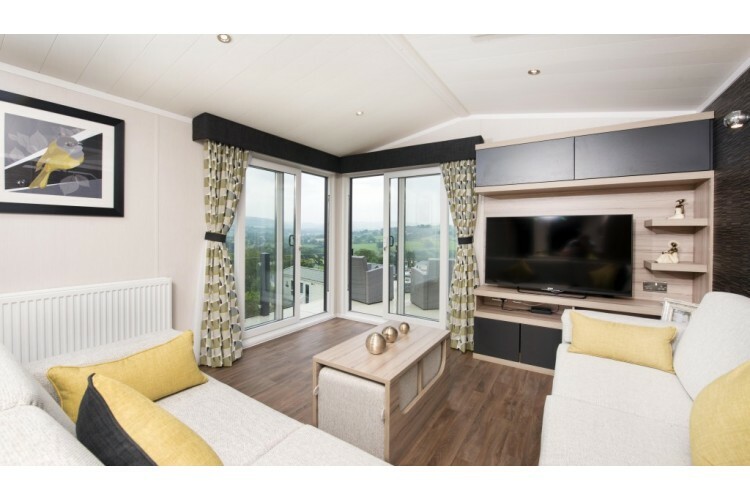 This unit will come as a turn key price including large brand new decking and block paved driveway, Sited on a 12 Month Holiday Plot in a great position on the Park. Unlike many statics, the colour scheme here was a pleasing combination of black, Sandy Beige and charcoal, giving an understated, yet stylish look. The front elevation in particular features a sort of deck-to-roofline perforated metal panel into which has been set a smart external light, thus breaking up the expanse of cladding and adding another dimension – a nice touch. The construction features a bonded sandwich exterior wall for greater strength and a coated steel pantile effect roof covering. 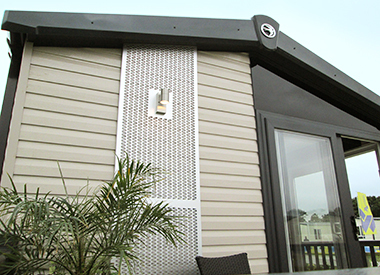 Distinctive, moulded GRP bargeboards set off the roof and the woodgrain textured aluminium cladding is available in several colour choices. There are uPVC windows and a fully glazed front nearside door plus a sliding patio door to the front aspect. The usual PVC gutters and downpipes plus exterior low energy lighting complete the scene. 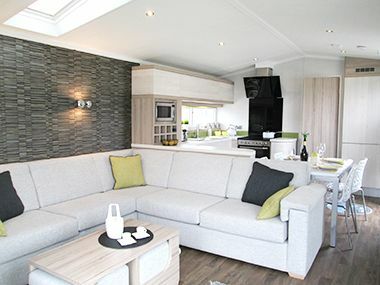 The whole caravan sits atop a Fusion fully galvanised chassis – an essential requirement considering the proximity of many of these caravans, sited as they are, near to the salt-laden air of the coast. 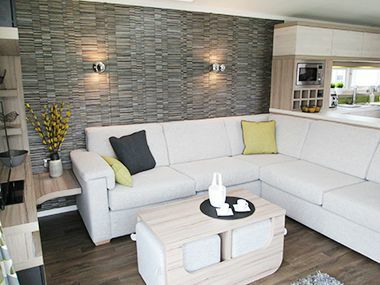 Being built to the BS3632 residential specification, the Alsace is well insulated. The uPVC doors and windows have Thermaglas and there’s 50mm of insulation to floor, 90mm in the roof and 30mm in the walls. All pipework below floor level has of course been lagged. Walking through one of the front patio doors into the lounge, you immediately feel the space created by a combination of large windows and open plan lounge and kitchen. The effect is on minimalist Scandinavian styling with bleached oak woodwork, cures and light fabric sofas accented by lime green and brown in cushions and curtains. The floor plan makes the most of the space and those light surfaces enhance the modern, clean feel. There is a useful option of having a Velux roof light fitted to both lounge and kitchen which, we think, would allow even more natural light to flood in. 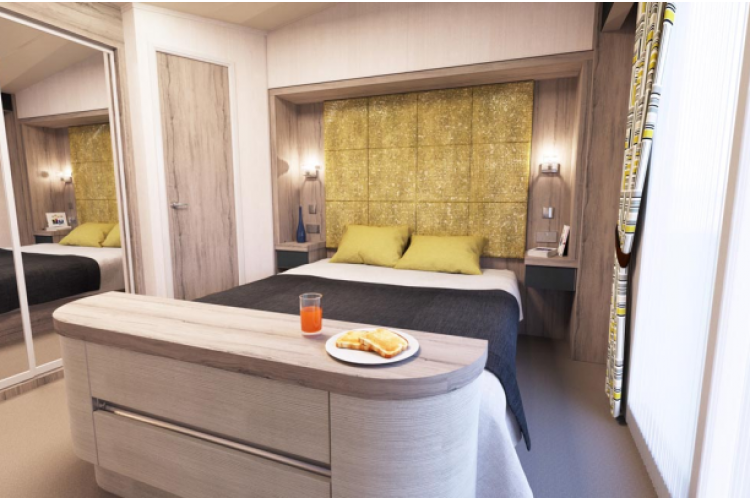 There is a large, free-standing sofa which will convert into a sofa bed for extra visitors and, on one side at the back, a feature wall has been enhanced by designer wallpaper, and chrome up and down lighters. Where a fireplace would usually sit, a special TV and storage unit takes up one corner and has display shelves and sockets for TV and DVD player. There is a central coffee table – again with attractive curved top – which ingeniously hides two cube-shaped pouffes that can be pulled out for extra seating. Flooring throughout the lounge and kitchen is a practical, easy to clean vinyl wood effect. 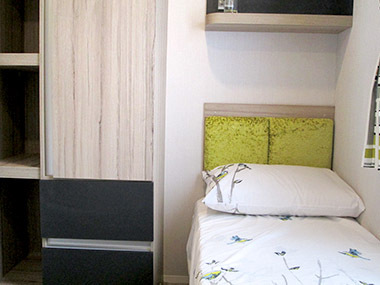 The bedrooms are carpeted in a quality 1300gsm carpet. 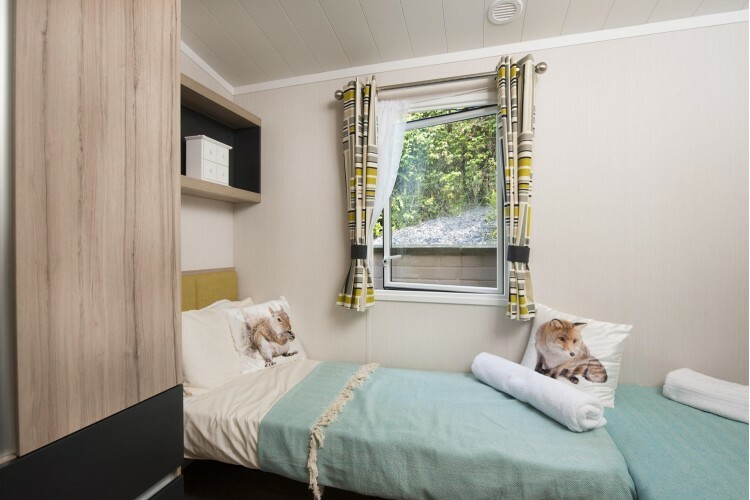 The room is heated with radiators fed from the caravan’s own gas combi-boiler which also supplies hot water to the bathroom and kitchen. The kitchen is in a shallow C-shape, and features what Swift call Ida Elm natural finish handle-less doors to cupboards and curved end base units. 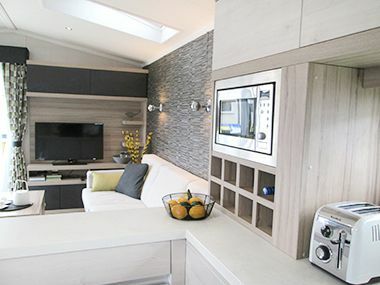 There is a large amount of Aurora Bianco work surface to help get to grips with food preparation and a built in microwave oven sits above a handy wine rack. On the opposite side sits a four burner hob with grill and oven above which is a smart, angled extractor hood in shiny black and a black aluminium splashback-come-heatshield. A stainless steel bowl sink and drainer is in front of the window and an integrated fridge freezer is fitted as standard. An optional 12 setting dishwasher is available as an option if required. 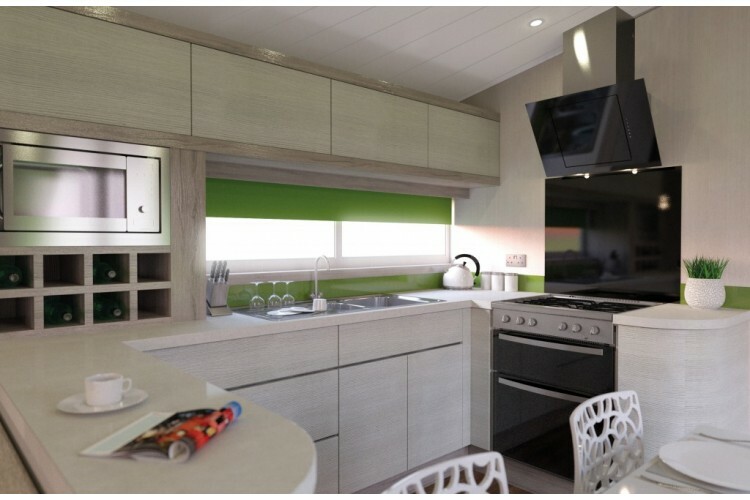 We liked the inclusion of lime green splashbacks to the work surface which gives a continuity of style to the kitchen and links it to the accent colour used throughout the Alsace. Opposite the kitchen and to the rear of the sofa is the dining table in a gloss white with four white patterned dining chairs. A central door leads you through into the sleeping accommodation. The first door on your right takes you to the main bathroom. 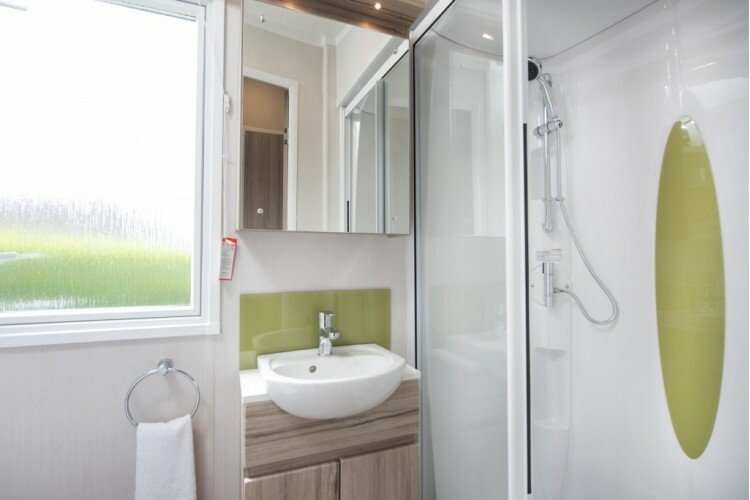 A large walk-in shower with glass sliding door has a thermostatically controlled shower head and a useful down lighter set into the top of the shower cubicle. 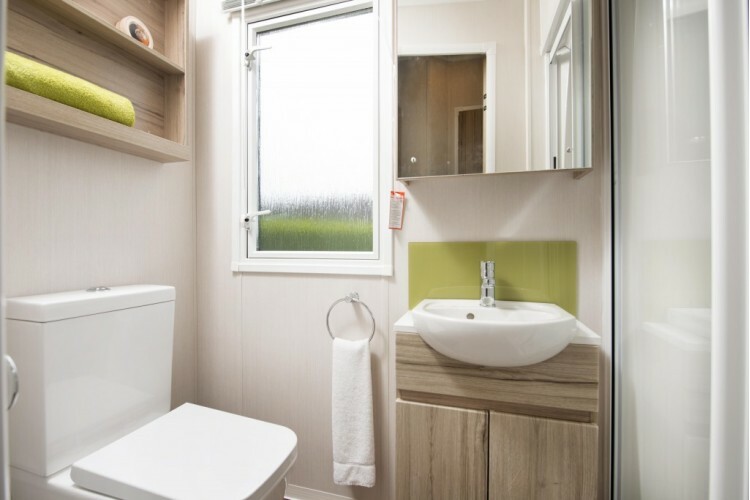 White porcelain double flush toilet and a designer handbasin with storage under are offset by pale grey wipe down walls and again, that green accent in the splashback and towel. Unlike some bathrooms, this one is large enough for you to wipe yourself down without smashing your elbows on the walls! Opposite, on the other side of the corridor is the twin bedded room. Usually, these twin rooms are tiny with hardy space to walk between the beds. 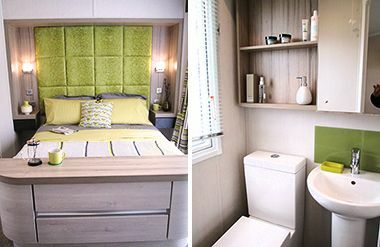 Here, the designers have ingeniously put the beds at right angles to each other creating a useable bit of floorspace. The room is neat with wardrobe and shelf storage built in and an overhead shelf. The bed has a padded headboard. The final door leads us to the master bedroom. This well dressed room has a king sized double bed with Duvalay pocket sprung mattress (the same in the twin), a fabric headboard and lined curtains with tie-backs. On the two bed Alsace, there is an Ottoman style box with curved ends at the foot of the bed for extra drawer storage. 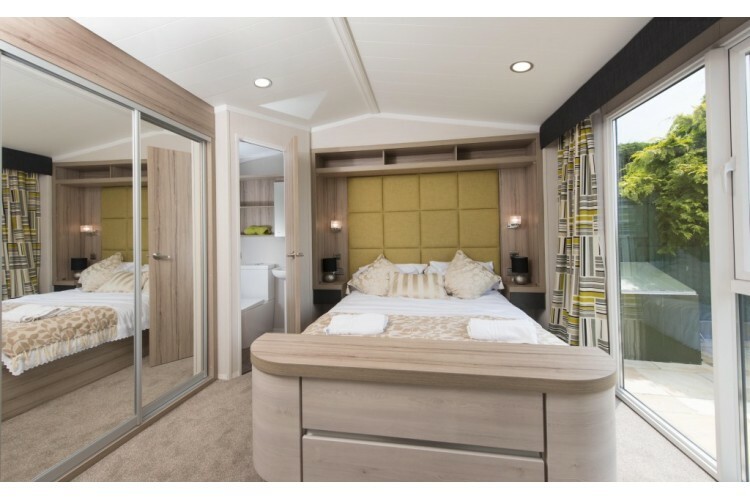 There are mirrored sliding wardrobe doors revealing enough clothes storage for two people and a small en suite replete with double flush toilet, handbasin, mirror and heated towel rail. At the foot of the bed is a vanity area with illuminated mirror and sockets for a flat screen TV if required. 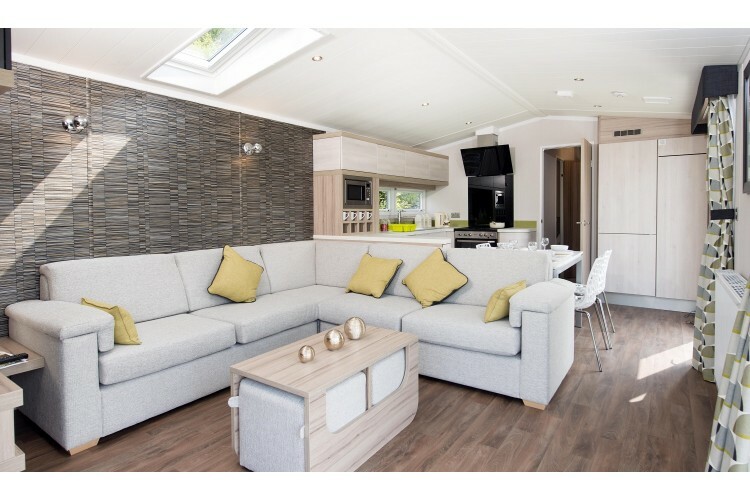 Swift’s Alsace is a departure from their usual static range and makes the most of the space afforded by the open plan design. 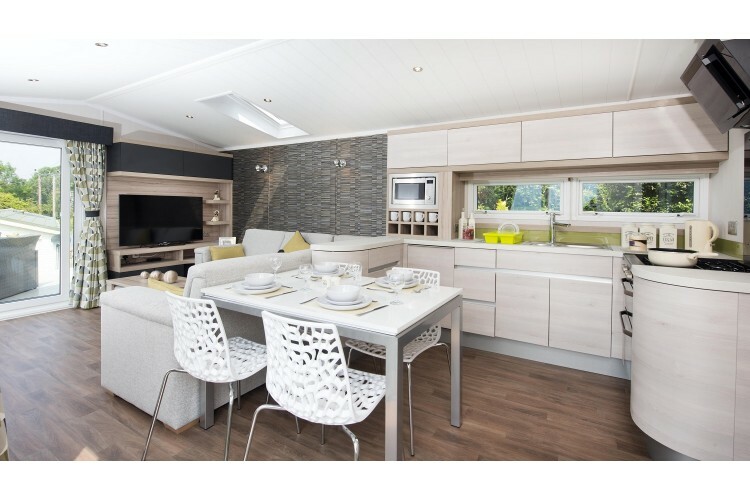 Both the exterior and inside have nice, stylish, clean lines and this caravan would certainly appeal to the younger end of the market. 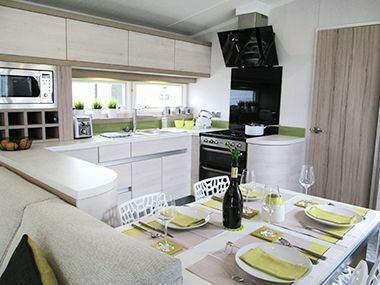 It’s keenly priced, too, and includes everything you’d need to get started in a static caravan.